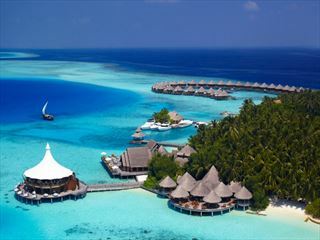 A picturesque and breathtaking 30 minute seaplane ride from Male will bring you here. 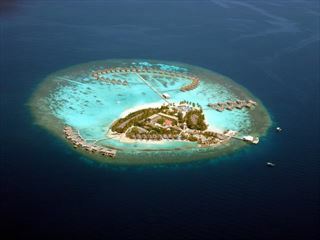 This emerald gem is just 350 meters long and 50 meters wide with a sparkling palm-fringed beach of fine white sand. Walk barefoot if you choose, this is as close to nature as you can get. Blessed with white talc beaches, turquoise blue waters and one of the most amazing house-reefs, it is truly a vision of paradise on earth. Of the 36 rooms only 6 are on the island. All are equally designed, featuring designer furnishing, polished wooden floors. Thirty are built on stilts over the blue lagoon. The Water Villas will spoil you with a spacious, luxurious en-suite bathroom, overlooking the ocean through two large sliding glass doors. Step outside on the private deck and relax, as each balcony has been designed to guarantee complete privacy. 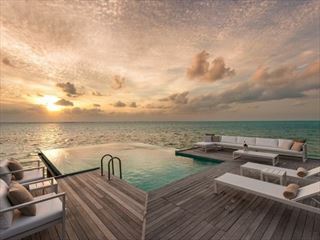 Each Water Villa also offers steps from the balcony for direct accesses to the Ocean. Beach Bungalows - King size or twin beds, air conditioning, ceiling fan, sitting area with CD stereo system and fully stocked minibar, Coffee and Espresso maker, IDD telephone and personal safe. The Beach Villas offer an oversized open-air bathroom with a luxurious fresh water shower as well as direct access to the beach. Water Bungalows - King size or twin beds, air conditioning, ceiling fan, sitting area with CD stereo system and fully stocked minibar, Coffee and Espresso maker, IDD telephone and personal safe. The Water Villas will spoil you with a spacious, luxurious en-suite bathroom, private deck, as each balcony has been designed to guarantee complete privacy. Each Water Villa also offers steps from the balcony for direct accesses to the Ocean, as well as a fresh water shower at the staircase. If you feel like being more active, take one of the ocean kayaks and paddle around the island. On windy days, we have a complete range of windsurf gear available, suiting everyone from beginner to expert. The use of the water sports equipment is available complimentary to all our guests. Did you ever dream of escaping to a small tropical island? Here this dream can become reality when we send you to a deserted island close by. Alternatively, choose from the many excursions, such as Island Hopping, a visit to a local cultural Island, a Sunset Cruise, Snorkelling Safaris, or tailor a trip according to your desires. Diving is a priority for many guests and the hotel caters to all levels of divers, from first timers wishing to learn the basics to the experienced diver wanting to fine-tune his techniques. Ocean Pro operates the dive base on Mirihi and with over 40 dive sites and a multilingual team, every guest is assured a most personal service. If you look for relaxation and pampering, visit the Duniye Spa. Trained therapists know how to relieve the stress from your body and relax your muscles. Choose from a large variety of treatments, ranging from a relaxing Swedish massage to traditional Thai treatments to various facials. Alternatively, choose our Adam and Eve treatment, a couple massage followed by a bottle of Champagne on your private balcony. Dhonveli - This restaurant with traditional sand floor and sumptuous buffet will amaze you each day. Serving three meals a day, you will find a combination of international specialties and local seafood. Catering to guests from all over the world, dishes are carefully selected to offer a wide variety and to guarantee sufficient choice even for those staying on Mirihi for several weeks. Muraka - Enjoy a Cocktail while watching the dazzling Sunset from the deck and stay for a romantic dinner. Let us spoil your pallet with some delicious seafood, lobster or Angus beef, combined with wines from our international list. With over 150 different wines to choose from, our master of wine selected some of the best vintages from the old and the new world. Whether it is a special occasion or you just wish to treat your loved one, Muraka is the perfect choice. Anba Bar - Meet with friends for a cocktail or just relax during the day enjoying light snacks. This well stocked bar is open everyday from morning till late.